The compilation album "Time And Again" was released on CD and in digital format on 18 March 2016. This two CD set features 35 tracks combining hits on disc 1 (tracks 1-15 remastered) plus rare and unreleased remixes on disc 2. The cover features a shot of the band (Paul, Magne, Morten) dressed in black jackets and hats against a grey sky. The title and large a-ha logo are printed in a dusty pink at the bottom of the sleeve. The Argentine edition comes with the same front cover as the UK/European made release displaying the shot of the band (Paul, Magne, Morten) dressed in black jackets and hats against a grey sky. 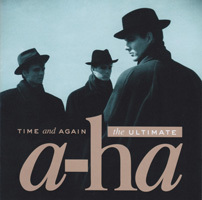 The title "TIME and AGAIN" is printed in gold with "the ULTIMATE" being instead in white but without the golden background to it and the large a-ha logo again shown in gold at the bottom of the sleeve. The black rectangular sticker; "CD COLLECTION OF A-HA'S BIGGEST HITS + RARE and PREVIOUSLY UNRELEASED remixes 8122-79472-0" similar to the one used on the UK edition is also included, but doesn't have rounded corners to it, plus the colouring of the blue text is somewhat darker. The reverse of the sleeve is vertually the same as the UK release, displaying the full track listing again in gold down the left and right hand sides of the upper sleeve. The regular white barcode containing the same number "0 81227 94720 0" as the UK edition is shown as usual in the bottom left hand corner. The same "WB" and "RHINO" logos are also displayed, but an additional "WARNER MUSIC GROUP" one has now been included. Along the bottom of the back sleeve printed in aqua is some additional Manufacturing and Copyright information shown in Spanish which reads; "This Compilation ℗ & Ⓒ 2016 Rhino Entertainment Company, a Warner Music Group Company. All Rights Reserved. Marketed by Rhino Entertainment Company. Publicado y distribuido por Warner Music Argentina S.A. Miembro de CAPIF. Reservados todos los derechos del productor, de los autores y de los interpretes de las obras reproducidas en este ejemplar, prohibida la reproduccion, alquiler, prestamo, canje, ejecucion publica, radiodifusion y cualquier uso no autorizado de estos fonogramas. SADAIC - BIEM / AADI - CAPIF. INDUSTRIA ARGENTINA". 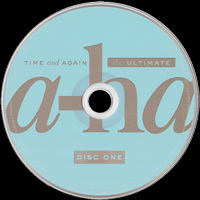 The discs themselves comes with the regular UK layout which are aqua for disc one with light brown and white text for the title and the large brown a-ha logo spread across the centre, whilst disc 2 comes instead the other way around with a light brown disc with the title shown instead in aqua and white, with the large a-ha logo printed additionally in aqua. Around the outer edge of both discs is the same Spanish Manufacturing and Copyright text which appears on the back sleeve. The release also includes the same colour booklet displaying pictures selected from A-ha's previous albums and history of the tracks included on this complilation taken from quotes by Pal and Magne. The catalogue number 8122-79472-0 also comes with a slightly different layout compared to the UK release. The promo Argentinian made CD comes with an additional red promo stamp on both discs which reads; "DISCO PROMOCIONAL PROHIBIDA SU VENTA". The 2 CD Collection of "TIME and AGAIN the ULTIMATE a-ha" was also Manufactured and distributed by "Warner Music Australia", it comes with the regular front and back cover artworks but doesn’t include the black rectangular sticker with the blue and white text on the front of the CD case. On the back sleeve, the white barcode shown comes with a different number "9 397601 005789" compared to the UK edition, plus there is also some different Manufacturing, Copyright and Marketing information displayed along the bottom which reads; "This Compilation ℗ 2016 Rhino Entertainment Company. Artwork © 2016 Rhino Entertainment Company, a Warner Music Group Company. All Rights Reserved. Unauthorized copying, hiring, lending, public performance, and broadcasting of this recording prohibited. Marketed in Australia by Warner Music Australia Pty Limited under exclusive licence. Manufactured and distributed by Warner Music Australia. A Warner Group Company. www.warnermusic.com.au www.rhino.com". The regular "WB Records" and "Rhino" logos are also included. The discs themselves are similar to the UK edition with disc one again being aqua with light brown and silver text, whilst disc two is coloured light brown with aqua and silver text. The same Australian Manufacturing, Copyright and Marketing text which is displayed on the back sleeve is also printed around the outer rim of each disc. The album comes with the regular colour booklet but displays a slightly amended Catalogue number compared to the UK release to read; 8122794720. The Chilean release was Manufactured and distributed by "Musica & Marketing Chile Ltda under license to Warner Music Chile S.A." and comes with a similar front and back cover artwork sleeve to the UK edition. The regular rectangular black sticker displaying the text; "2CD COLLECTION OF A-HA’S BIGGEST HITS + RARE and PREVIOUSLY UNRELEASED remixes" in blue and white is included on the front of the CD case. On the back sleeve, the regular white barcode is also included again displaying the same number "0 81227 94720 0" as the UK release. The manufacturing, distributing and copyright information is also printed in Spanish to read; "This Compilation ℗ & © 2016 Rhino Entertainment Company, a Warner Music Group Company. All Rights Reserved. Marketed by Rhino Entertainment Company. LC02982 www.rhino.com ℗ & © 2016 Fabricado y distribuido por Musica & Marketing Chile Ltda. Bajo Licencia de Warner Music Chile S.A. Reservados todos los derechos del productor, de los autores, y de los interpretes de las obras reproducidas en este ejemplar, prohibida la reproduccion, regrabacion, alquiler, prestamo, canje, ejecucion publica, Radiodifusion y cualquier uso no autorizado de estos fonogramas. Ley 17.336. Hecho en Chile. El disco es cultura". There is also some additional logos included on the back sleeve which include the usual WB Records and RHINO ones, plus MUSICA & MARKETING CHILE LTD and WARNER MUSIC CHILE. The Catalogue number is 081227947200. The Japanese CD album release of "TIME and AGAIN the ULTIMATE a-ha" includes a black obi-strip with gold and white text. On the front of the obi at the top, it displays in white the wording "STEREO" in both English and Japanese with a gold "a-ha" logo underneath. The album title also displayed in gold and printed in Japanese is shown down the left hand side. On the right hand side, there is some other Japanese text about the album release but this is coloured instead in white. There is also a light blue stripe at the bottom end of the obi with some further Japanese text, again in white. The regular WB Records and RHINO logos, album price tag ¥2,900 and release date 24.11.16 are also additionally included. On the actual spine, there is a small picture of the album cover displayed at the top with the golden a-ha logo and title printed again in Japanese and shown landscaped in the centre. A small blue stripe with white text has again been included at the bottom end of the obi displaying "CD2" in both English and Japanese. The Warner Music logo and Catalogue number WPCR 17199/200 are also included. The full track listing is listed in Japanese and printed in gold on the back of the obi-strip, there is a white barcode displaying a different number "4 943674 230549" at the bottom, along with the "STEREO", "COMPACT disc DIGITAL AUDIO" and "JASPAC""" logos. There is also some other white Japanese text, plus that the album was also "MADE IN JAPAN". On the actual front of the CD case, it comes instead with a gold and white square Japanese sticker (rather than the usual black rectangular one with blue and white text) advertising the release of the album, it again shows the a-ha logo, title in Japanese and Catalogue number. 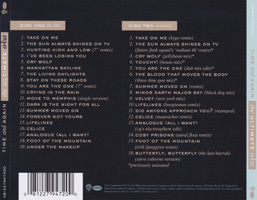 The front and back sleeve of the album is very similar to the UK edition showing the regular artworks and same track listing. The manufacturing, distributing and copyright information on the black sleeve has been slightly amended to read; "This Compilation ℗ & © 2016 Rhino Entertainment Company, a Warner Music Group Company. All Rights Reserved. Unauthorized duplication and making transmittable of this disc prohibited. Manufactured and distributed by Warner Music Japan Inc., a Warner Music Group Company". The usual WB Records and Rhino logos are also included. There is a Mexican CD release of "TIME and AGAIN the ULTIMATE a-ha" which comes with the usual album artworks similar to the UK edition. The regular black "2CD COLLECTION OF A-HA’S BIGGEST HITS + RARE and PREVIOUSLY UNRELEASED remixes" sticker with blue and white text is included, but this time it’s shaped square rather than rectangular and includes the UK Catalogue number 081227947200 printed on it. There is also an additional silver "ifpi" hologram sticker displayed on the front of the CD case as well. On the back cover the Manufacturing, Distributing and Copyright information is shown in Spanish and reads; "Esta compilacion ℗© 2016 Rhino Entertaimente Company a Warner Music Group Company. Los derechos sobre el fonograma se encuentran reconocidos por la Ley Federal del Derecho de Autor. Se prohibe su produccion, reproduccion, importacion, almacenamienio, transporte, distribucion, comercializacion, venta o arrendamiemo, asi como su adaptacion, transformacion y comunicacion directa al public sin la previa autorizacion por escrito del titular. La violacion a estaprohibicion constituye un delito y una infraccion, sancionadas conforme a los articulos 424 Bis del Codigo Penal Federal: 231 fraccion lll y 232 fraccion l, de la Ley Federal del Derecho de Autor y demas mormas aplicables vigemes, incluyendo las de caracier intermacional Hecho en Mexico y Distribuido por Warner Music Mexico S.A. DE C.V. A Warner Music Group Company. Marcas Registradas para su venta en Mexico.Leibnitz No. 32. Col Nueva Anzures. 11590 Mexico. D.F. Tel. 5729-38-00. "La musica es cultura". At the bottom left hand corner, the regular white barcode is shown but is slightly smaller in size and again displaying the same number "0 81227 94720 0" as the UK edition. The regular "WB Records" and "RHINO" logos are included along with an additional "COMPACT disc DIGITAL AUDIO", blue "WARNER MUSIC MEXICO" and Anti-piracy logos. The "www.warnermusic.com.mx" website address is also present. On the spine, the Catalogue number 7947200 used has been shortened to display only the last seven digits. The discs themselves come with the similar UK layout but don’t include an outer silver rim, they contain an aqua coloured disc one with light brown and silver text for the title, but doesn’t have the brown background for the wording "the ULTIMATE" and the large brown a-ha logo is spread across the centre. Disc 2 comes instead with a light brown disc with the title shown as usual in aqua and silver, but again there is no aqua background colouring to the wording "the ULTIMATE". The large a-ha logo has again been printed in the centre additionally shown in the aqua. Around the outer edge of both discs is some Spanish Manufacturing, Distributing and Copyright text similar to that shown on the back sleeve; "Este Compilacion ℗© 2016 Rhino Entertainment Company a Warner Music Group Company. Hecho en Mexico y distribuido por Warner Music Mexico S.A. DE C.V. a Warner Music Group Company. Prohibida la reproduction y radiodifusion de este Fonograma. Reservados todos los derechos del productor fonografico". The album also includes the regular 23 paged colour booklet. The Russian CD edition of "TIME and AGAIN the ULTIMATE a-ha"is similar to the UK release displaying the same front cover artworks, but doesn't include the usual "2CD COLLECTION OF A-HA’S BIGGEST HITS + RARE and PREVIOUSLY UNRELEASED remixes" black sticker. The album also contains the regular colour 23 paged booklet but some copies, if not all, have been printed incorrectly and display the pages in a completely wrong order. The back cover also additionally includes the Catalogue number along with some Russian text; "ПРОИЗВЕДЕНО В РОССИИ. ВСЕ ПРАВА ЗАЩИЩЕНЫ. 8122794628", when translated, it reads; "MANUFACTURED IN RUSSIA. ALL RIGHTS RESERVED". On the actual back sleeve, it comes with the same track listing as the UK release, but displays a different barcode number "0 081227 946289" at the bottom left hand corner. The regular "WB" and "Rhino" logos are also present, but an additional "WARNER MUSIC RUSSIA" logo has been added. Along the bottom of the back sleeve is some Russian Manufacturing and Copyright Information, which includes some Russian Record Company contact details and a website address; "This Compilation ℗ & © 2016 Rhino Entertainment Company, a Warner Music Group Company. All Rights Reserved. Unauthorized copying, hiring, lending, public performance, and broadcasting of this recording prohibited. Выпущено ооо «Ворнер Мьюзик», 2016. Проиэведено в России. Все права эащищены. Нарушения преследуются по эакону. Преднаэначено исключительно для домашнего прослушивания. Испольэование проиэведений беэ получения раэрешения правооблателя эапрещено. Иепольэование фонограмм путём публичного исполнения, передачи в эфир и сообщения для всеобщего сведения по кабелю воэможно только при уеловии выплаты воэнагражления. Сбор воэнаграждения осуществляется органиэацией по управлению правами на коллективной основе. Маркетинг и дистр. в СНГ: ООО «Ворнер Мьюзик». Юр. адрес: Россия. 105066.г. Москва. ул. Старая Басманная. д. 32. стр. 1А: факт, адрес и адрес для налравления предложений и претенэии: Россия. 105120, г. Москва. Наставнический пер. Л. 17, стр. 1. Тел. : +74957875670, факс: +74957875676: e-mail: [email protected] Муэыкалыный компакт-диск формата CD-DA. Техниуеские характеристики IEC 908 Red Book. Обяэателыюй сертификащии не нодлежит. Не полвергап. механическому нли магнитному воэдеиетвию. Иэбегать попалания прямых солнечных лучей или влаги. Иэготовитель (см. инф. на внутр. кольце диска): ооо Сони ДАДС. Лпценэия РОСКОМНАДЭОРа № 77-339 от 19.11.2010 г.. 249010. Калужская обя..г. Боровск. ул. Большая. л. 83. стр. 1. www.warnermusic.ru.". The layout & design of the discs are again very similar to the UK edition, but without the outer silver rim. 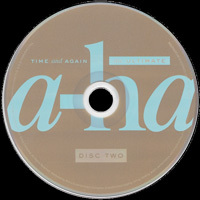 Disc One is aqua coloured with the light brown and silver text for the title, displaying a large brown a-ha logo spread across the centre. Disc 2 comes instead with a light brown disc, showing the title as usual in aqua and silver. The large a-ha logo has again been printed in the centre additionally shown in the aqua. At the lower half of each disc under the "DISC ONE/DISC TWO" labels, it additionally displays a "WARNER MUSIC RUSSIA" logo. Around the outer edge of both discs is some Russian Manufacturing and Copyright text which is similar to that printed on the back sleeve; "Выпущено ООО Ворнер Мьюэик, 2016. Проиэведено в России. Все права эащищены. Нарушения преследуются по эакону. Преднаэначено исключительно для домашнего прослушивания. Испольэование фонограмм путем публичного исполнения, передачи в эфир и сообщения для всеобщего сведения по кабелю воэможно только при условии выплаты воэнаграждения. 8122794628-1". The CD release comes with the regular front and back cover artworks and includes a blue and white "WARNER MUSIC THAILAND ifp1 399 uาn" sticker at the bottom right hand corner of the CD Case. The usual black rectangular sticker displaying; "2CD COLLECTION OF A-HA'S BIGGEST HITS + RARE and PREVIOUSLY UNRELEASED remixes 081227947200" similar to the one used on the UK edition is also included, but doesn't have rounded corners to it. The back of the CD case also includes another small white rectangular sticker displaying some further Thai printed text in black. On the back sleeve the Manufacturing and Copyright Information has been amended to read; "This Compilation ℗ & Ⓒ 2016 Rhino Entertainment Company, a Warner Music Group Company. All Rights Reserved. Marketed by Rhino Entertainment Company. Unauthorized copying, hiring, lending, public performance, and broadcasting of this recording prohibited. Manufactured and distributed by Warner Music Thailand. LC02982 www.rhino.com". The release also comes with the same catalogue number 081227947200 and white barcode as the UK edition, plus the "WB Records" and "Rhino" logos are additionally shown. The discs themselves are coloured darker than the UK edition, Disc one is coloured sky blue (rather than aqua) and the title "TIME and AGAIN the ULTIMATE a-ha" has been printed instead partly in silver and chocolate brown. Disc two comes with the chocolate coloured disc with the title again shown partly in silver and sky blue. Around the outer edge of both discs displayed in silver is the same Manufacturing and distributing information which appears on the back sleeve. The album additionally comes with the same colour booklet as the UK edition apart from the colouring on it is again slightly darker. The Thailand promo edition is the same as the regular release but appears to come without any stickers on the front and back of the CD case. Around the centre ring of both discs has the additional wording; "NOT FOR SALE PROMOTION ONLY" printed in white. The Catalogue number is also exactly the same.